Lori Fung has been working with the Killarney Figure Skating Club for many years. She won the Olympic Gold in 1984 in the Sport of Rhythmic Gymnastics. She has many accomplishments including Canadian National Team Coach since 1991, the original founder of Club Elite Rhythmics in Vancouver, as well as Member of the BC and Canadian Sports Hall of Fame. Lori's class will focus on improvements to flexibility and developing increased range of motion. 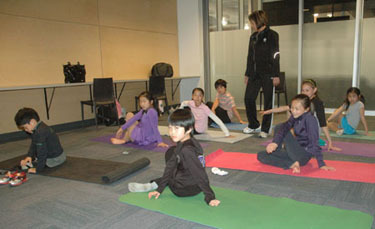 The benefits in flexibility training include: injury prevention, improved extension, improved positioning for spirals, spins and basic skating skills. Daily stretching and flexibility work is highly recommended for overall improvements in this area. Maki has worked as a strength and conditioning instructor in the Richmond and Vancouver area for the past 13 years. Maki and his team have been working with the Killarney Figure Skating Club for a number of years. He currently works with figure skating clubs and develops specialized training routines to improve strength and development on the ice. These classes will consist of a full body workout with the goal of developing a strong, well-rounded foundation. This off-ice class has been developed by KCFSC coaches to improve performance on the ice. During this class skaters will work through a series of warm-up exercises and then transition into specific skill development. Emphasis will be put on correct jump and rotation technique, as well as developing flexibility and spin positions. Core and overall body strength will also be an important component in this class. The coaches would like to remind skaters that it is highly recommended that skaters incorporate dryland training before any on-ice session to avoid injury and assist with warm-up.